Van Cliburn Diagnosed With Bone Cancer : Deceptive Cadence The iconic American classical pianist who first rocketed to fame at the Tchaikovsky Competition in 1958 has announced his advanced illness. President Obama congratulates pianist Van Cliburn after presenting him with the National Medal of Arts in 2011. Renowned Fort Worth pianist Van Cliburn, 78, has bone cancer. Long time friend and publicist Mary Lou Falcone issued this brief statement Monday afternoon. "Van Cliburn has been diagnosed with advanced bone cancer," Falcone said. "He is under excellent care and resting comfortably at home. His spirits are high. We ask that his privacy be respected." KERA will report more information as we receive it. The station has a decades-long relationship with Cliburn and The Cliburn Foundation. KERA has for many years presented award-winning documentaries about the Van Cliburn International Piano Competition, held every four years. Cliburn, of course, rocketed to worldwide fame when he won the first International Tchaikovsky Competition in 1958 — when he was only 23. Although he was born in Louisiana, his family moved to Kilgore, Texas, when he was six, and he won a competition to debut with the Houston Symphony. It was through his training from his mother — the former Rildia Bee O'Bryan, who was taught by a pupil of Franz Liszt — and from his Juilliard teacher, Rosina Lhevinne, that he was imbued with the tradition of romantic piano-playing, especially the great Russian pianists. After his Tchaikovsky victory, he was accorded the only ticker tape parade in New York ever given a classical musician, and his recording of the Tchaikovsky Piano Concerto No. 1 became the best-selling classical album for more than a decade, eventually going triple platinum. That same year, 1958, the president of the National Guild of Piano Teachers, Dr. Irl Allison, announced a $10,000 cash prize for a piano competition named in Cliburn's honor. The First Van Cliburn International Piano Competition was held in 1962 at Texas Christian University. Over the following decades, even as Cliburn's own touring and performing career wavered and narrowed, the competition with his name became the most important one in the world. Cliburn withdrew from performing and from public life entirely, following the death of his father and manager in 1978. But in 1987 he performed at the White House for President Ronald Reagan and Soviet president Mikhail Gorbachev — and returned to performing in public but only rarely. In 1989, he performed at the opening of the Meyerson Symphony Center, as chronicled in the KERA documentary Frozen Music. 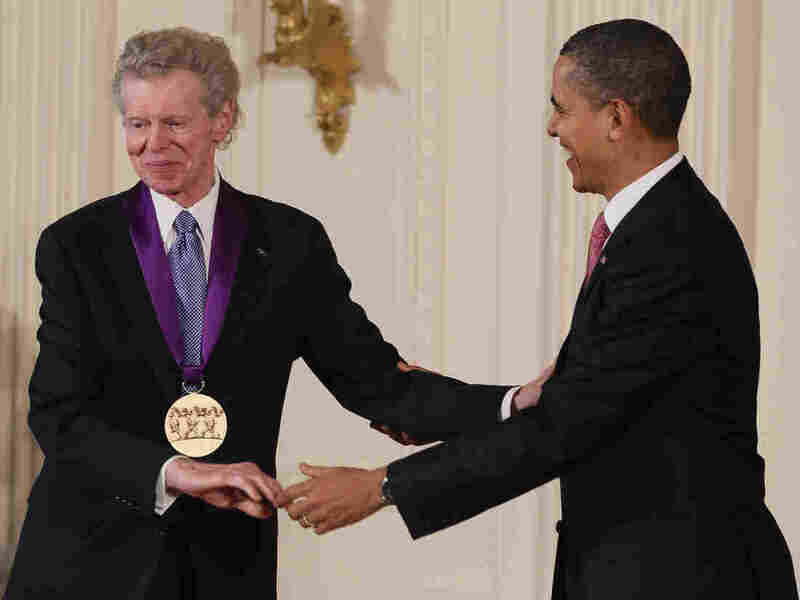 Last year, Cliburn received the National Medal of Arts from President Barack Obama at the White House — having previously received the Presidential Medal of Freedom from President George W. Bush in 2003. KERA reporter Bill Zeeble contributed to this story, which originally appeared on KERA's Art & Seek.